When I first started blogging back in December, one of the blogs that inspired me to do so was Sarah Trivuncic's Maison Cupcake. Sarah started blogging in 2009, and her blog quickly developed into a way of exploring the world of baking. Now, in 2012, it has become one of the most well know food blogs in the UK and June saw the release of Sarah's first book, Sweet Bite Sized Bakes, one of the Bake Me I'm Yours series. This is on my 'want, want, want' list. 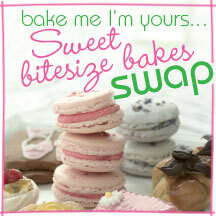 To celebrate the launch of the book, the publishers organised a Bake Swap on their website BakeMe.com; if you signed up you would be paired with a partner to swap some baked treats. Hopefully, you might just find a friend, too. The bakes had to be posted on or before 2 July. I was paired with Emma. The email announcing this didn't give me any other details (other than her address), so I spent some time pondering what I could make, for someone I didn't know, didn't know what they liked, and which would survive the journey intact and would deliver on the promise of a 'treat'. I decided on two kinds of cookies: White Chocolate and Cranberry, and Dark Chocolate and Toasted Hazelnut. I used my basic Chocolate Chip Cookie recipe, just substituting the 150g chocolate chips for 100g white chocolate chips and 50g dried cranberries, and in another batch, 100g dark chocolate chips and 50g chopped toasted hazelnuts. I also added a pinch of salt to each batch - just to counter any possible over-sweetness, and to balance out the flavour (and I think it worked really well so will probably do that all the time from now on!). I used a kilner jar as packaging, as it was just the right size, and had a go at making a handmade label as a finishing touch - wrapped in plenty of bubble wrap I just hope they got to Emma without breaking! So, today, my treat from Emma arrived. A fantastic tin of Peanut Butter and Chocolate Chip cookies, with a lovely little card. Talk about great minds thinking alike though, as we both thought about cookies! I've never done anything like this before, but I really enjoyed it. Up until 9 July, those who took part will be uploading a picture of our received treat to BakeMe's Facebook Page as a way of saying 'Thank You' to our baking partner. So you can visit and check out all the other swaps! The best five will win a copy of Sarah's book. I LOVE cookies and all of these sound amazing. Clearly great minds to think alike. I wish I could have joined in the bake swap but am travelling so had to give it a miss. This was such a fun idea and I was planning on taking part - time ran away with me as usual though. Your cookies sound delicious and how nice to send them in a kilner jar - you can never have too many of those. How funny you should both do biscuits though. Oh this is so fun, what could be better than treats arriving in the post! I love that you packaged yours in that cute little jar and the cookies you sent look so delicious, I'm sure your partner was so pleased! you cookies look great, I always find they make anice present for people!